Bertran, R.; Buyuktosunoglu, A.; Gupta, M.; Gonzalez, M.; Bose, P.
Microprocessor-based systems today are composed of multi-core, multi-threaded processors with complex cache hierarchies and gigabytes of main memory. Accurate characterization of such a system, through predictive pre-silicon modeling and/or diagnostic postsilicon measurement based analysis are increasingly cumbersome and error prone. This is especially true of energy-related characterization studies. In this paper, we take the position that automated micro-benchmarks generated with particular objectives in mind hold the key to obtaining accurate energy-related characterization. As such, we first present a flexible micro-benchmark generation framework (MicroProbe) that is used to probe complex multi-core/multi-threaded systems with a variety and range of energy-related queries in mind. We then present experimental results centered around an IBM POWER7 CMP/SMT system to demonstrate how the systematically generated micro-benchmarks can be used to answer three specific queries: (a) How to project application-specific (and if needed, phase-specific) power consumption with component-wise breakdowns? (b) How to measure energy-per-instruction (EPI) values for the target machine? (c) How to bound the worst-case (maximum) power consumption in order to determine safe, but practical (i.e. affordable) packaging or cooling solutions? The solution approaches to the above problems are all new. Hardware measurement based analysis shows superior power projection accuracy (with error margins of less than 2.3% across SPEC CPU2006) as well as max-power stressing capability (with 10.7% increase in processor power over the very worst-case power seen during the execution of SPEC CPU2006 applications). Bertrán, R. [et al.]. Systematic energy characterization of CMP/SMT processor systems via automated micro-benchmarks. A: Annual IEEE/ACM International Symposium on Microarchitecture. 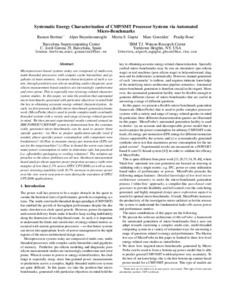 "Proceedings: 2012 IEEE/ACM 45th International Symposium on Microarchitecture: 1-5 December 2012. Vancouver, British Columbia, Canada". Vancouver, British Columbia: 2012, p. 199-211.